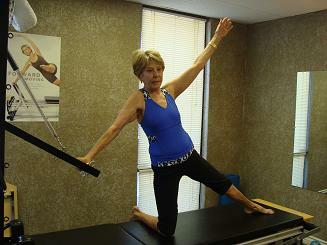 Pilates For Women at Any Age! Although Joseph Pilates was a man he truly believed in Pilates for women. In fact a majority of his students, and some, still living today are women. This is still true today as a majority of, but not all, my students are women. If you are a woman and looking for a long term exercise program that has staying power then look no further than Pilates. I have Pilates students who have been with me for over 6 years and they are always feeling challenged as no two Pilates routines are ever the same. Women's bodies are always changing and that is why Pilates for women exercises are so beneficial as they can change or be modified to however you are feeling that particular session or month or year. I will outline some of my own and my client's favorite Pilates exercise moves here. This is Winnie performing a Side Stretch or Mermaid on the Cadillac. 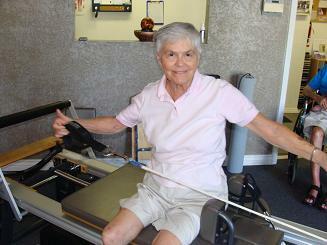 Winnie loves the feeling of stretching and bending and just moving and flowing in our Pilates sessions. She is a very graceful and energetic student that has been practicing Pilates for over 7 years. She is in her 70's and doesn't look over 60. Winnie continues to do Pilates to not only feel better, but to live a longer independent life where she can enjoy her favorite activities such as golf and travel. 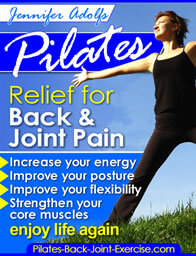 Find out how Pilates can help you and get started now with my newly revised Pilates Ebook – Relief for Back and Joint Pain. 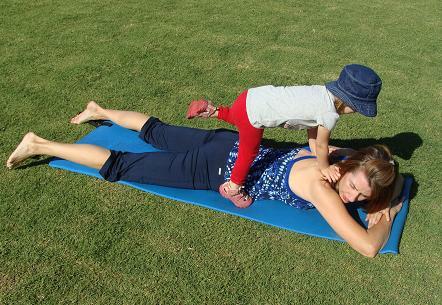 I love to do Pilates to stay young and spry to keep up with my toddler. You can see here that she loves it too. Anything to roll around with mommy on the floor. I have had several surgeries on my knees, broken bones, and somewhat arthritic hands already. Pilates exercises have given me the relief I need to continue to hike and bike and even chase a toddler around in my 40's. I love what Pilates has done for me and for my clients. What a joy to come to work every day knowing that I can improve someone's life and they will leave my place feeling so much better than when they came. See some of my Pilates Equipment Workouts on Youtube! Jeanne is a caregiver for her husband and needs all the strength and agility she can get to push him around in the wheelchair and other daily activities. Jeanne is in her 80's and has been practicing Pilates exercises with me for over 3 years. That just reiterates that you are never to old to get started with exercise. Jeanne has found more strength, flexibility, and energy doing Pilates for women Equipment workouts just twice a week for a half hour. Leave Pilates for Women and find out more about how Pilates can benefit you.